Temperature mapping is an essential component in maintaining the integrity or quality of temperature sensitive products like highly perishable fresh goods, drugs for medical use (research and administration for treatment), valuable old artwork and documents. The process allows products, merchandise and items to meet industry and government standards. 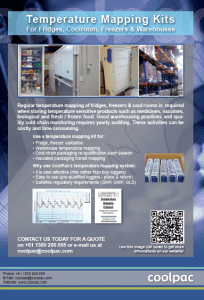 Temperature mapping is a systematic process, involving a temperature data loggers placed strategically in a temperature controlled environment such as a warehouse or fridge freezer. It allows organisations to measure the actual temperature in a 3d space and to ensure that it is within the correct temperature range for the products stored. And speaking of the important components of temperature or thermal mapping, provided below are four of them and their respective contributions to the objective of temperature mapping. 1. Good distribution practice – this is crucial because it ensures compliance to industry regulations or requirements. In addition to that, this system properly identifies the potential risks of temperature fluctuations, where in the operations and facility these risks are highly likely to emerge, and how these risks can be managed, and the operational system can be improved through the optimisation of energy, money, space and time. The process is also responsible for making sure that the products handled are manufactured and distributed correctly so quality is never compromised. 2. The right equipment is used for refrigeration, insulation and storage – ensuring a quality cold chain means ensuring the calibration of refrigeration monitoring equipment. These pieces of equipment include refrigeration units, cold storage, shipping containers, transport vehicles, packaging, etc. – all of which create the correct temperature for the products. 3. Proper facility set up – this will not only make equipment work more effectively but the right facility setup or layout can contribute significantly to energy-efficiency, heightened safety and overall streamlining of operations. 4. Methods – for every industry there’s a specific method and collection of values which are followed in ensuring that workers behave or act accordingly at all times, and the right temperature is upheld in all sensitive areas of operations. In the creation of methods, it’s imperative for OSH and thermal mapping professionals, facility managers and technicians to work together so the best work process can be established and all workers that will perform certain aspects of the method can be trained properly. With the right operational process, yielding consistent results can instantly be made easier, diminishing occupational risks and preventing the dissatisfaction of and potential harm to product end-users.